The July 2016 box of Little Box of Crochet is already my third box and still I enjoy the anticipation of what will be in the box. This time I knew that the designer is Christa Veenstra, and knowing her I had a suspicion what yarn would be in the box and I was right. The box was jam packed with Scheepjes yarn and one of my favorite yarns to boot. I love cotton yarn because of the awesome stitch definition, it’s durability and in the case of Scheepjes Catona, it’s sheen. Catona comes in cute little 25g balls (like the 5 balls included in the box) and larger 50g balls. The small balls are just perfect for smaller projects where you just need a bit of yarn of a particular color; projects like amigurumi animals and peacock feathers. The box this month was so full that there wasn’t even room for tissue paper! The box contains no less than 5 balls of yarn (those cute little 25g balls of Catona), a booklet containing the pattern by Christa Veenstra from The Curio Craftsroom and fellow Scheepjes Blogger, a needle, a 2.5mm crochet hook, colorful pins, a Korutumi stitch marker and 5 labels for marking your empty LBC-boxes so that you know what is inside them. Very thoughtful of Amanda to send us these labels, I have already attached them to my boxes. I was working on the pattern and noticed that there are a few gremlins in there. Just to help you out, here a few small tips and errata’s. There are 5 balls of 25g Scheepjes Catona yarn in the box. According to the pattern one of the balls should be 400 Petrol Blue. I suspect that that color was all out, because I had 261 Capri Blue in my box. So my Color C is a different color to the pattern. But that’s ok, because the two shades are very close together. We first make 5 small peacock feathers. These are just too cute for words, but the words got a little mixed up. If everything went right you got an email from Amanda about that. The pattern didn’t say which color to use for the long stitches in round 5, I used color B and then everything works out wonderfully and you have 5 lovely feathers. The feather fob also had no color listed, so I used Color A for that. 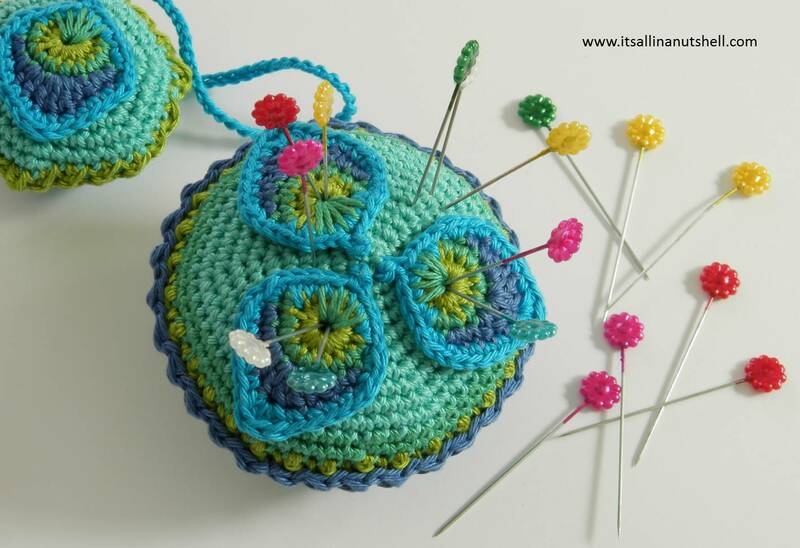 The pincushion is worked by closing each round with a slip stitch. I am too lazy for that so I worked my pincushion and fob amigurumi-style; so in a spiral. I closed the end with a very tight invisible join and then you really can’t tell that I cheated. Stuff both the pincushion and the fob like crazy for best results. For the fob I changed the color for the join to Color E and the cord I changed to Color D because I thought that gave more definition. No more looking for keys! I am ALWAYS looking for my keys, at least once a day. I never seem to leave them in the same place twice. To make life a little easier for me and also more beautiful at the same time, I have decided to connect the fob to my keys. This way, at least in theory, I can find them more easily. There is a lot of yarn in this month’s box. If you want to you could make more than one pincushion or fob. I am getting used to this little surprise every month. I am already looking forward to the August box, but I know that I will not be home when the mail man comes to bring it. I’m sure my neighbor will have it waiting for me when I return. That’s really beautiful, the little box of crochet is very tempting! Yep, really loving my ‘Little Box of Crochet’, had to be the best quality and best value out there for monthly subs! Esther, you have probably seen that Amanda (creator of Little Box of Crochet) and Jenny received the terrible news that Jenny’s cancer is back. Kate at Just Pootling (http://justpootling.blogspot.co.uk) is putting together a blanket of hugs for Jenny, asking all her blog followers to crochet 3 squares in Jenny’s favorite colors, which Kate will assemble. She’d like to have them in August. It’d be lovely if we could all send Jenny a crocheted hug. Oh my goodness, I love everything about this! The colors, the feathers and the usefulness! I want a box, too. It’s there a link to join the club? I may have missed it and will look again. I think I am too late to get myself a box with this project:(. Do you know if I can get the pattern alone? You can best contact Amanda at Little box of crochet, I do not know what the policy is on the patterns.